Formerly the Les Cimes Blanches Apartments and now under new management (partner to Hotel Fahrenheit 7 Val Thorens) these hotel rooms, offer the ultimate convenience with a fantastic piste side location plus a 100m walk to the centre of Courchevel 1650 providing a selection of shops, restaurants and bars. The Ariondaz gondola and ski school meet point are also just 200m from the property. Rest your muscles after a long day on the slopes in the new spa with sauna, hamman and massage rooms. Triple rooms (B3) sleep up to 3 and do not have a balcony. Self catered apartments and hotel rooms with half board catering. Three course evening meal taken in the Brasserie style Rôtisserie Restaurant/ There is also a wine bar called Le Pano. 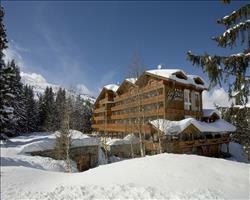 We update Fahrenheit Seven Courchevel's details often, but facilities do change. e.g. some extras listed by the supplier as "free" or included might only be for the first time you use them, or for one time per party, then charged for further use. If any specific feature is essential to your holiday, make sure you ask us to confirm the details of it before you book your holiday. This package holiday to Fahrenheit Seven Courchevel in Courchevel, France departs Saturday 14th December 2019, for a 7 night stay on a "half board" board basis. A local tourist tax (Taxe de Sejour or Kurtaxe) is levied by many councils in European ski resorts. It varies by standard and type of accommodation and is age dependent, so not everyone is charged. It's not included in the basic price of your holiday and is usually paid locally. For reference, the average charged in winter 15/16 was between 50p and £2 per person, per night. Courchevel lift pass price last reported as €218 (adult 6 day). Ask for a quote when booking Fahrenheit Seven Courchevel. 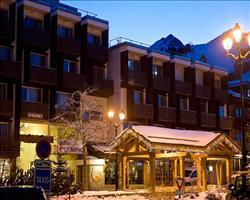 Hotel Olympic Courchevel France, Dover Ferry 14th December.